First, regarding “Write Articles, Win Books” competition: so far 28 entries received. And last date to submit is 25th Sept 2013. Click me for more details. Now moving to part 3 of 3: IT, gadgets, Nano-Tech, space + some physics-chemistry related topics. In mobile phones, the Data- transfer (internet plan) is still quite expensive in the third world. They’ll research on data-compression technologies, so that same mobile apps, can run on less data. They’ll gangup with app developers, mobile operators and device manufacturers to to introduce business models to get more people internet access. Benefit: low-cost, low-data versions of basic Internet services available to everyone. Will help reducing digital divide. The FOIA Machine (foiamachine.org) is an online open-source platform. It automates the process of filing the “RTI” in USA and tracks its progress. Recently Indian government also launched online portal to http://rtionline.gov.in to help citizens file RTIs online. America’s National Security Agency (NSA), has been monitoring communications between the US and foreign nationals over the internet for a number of years, under a project called Prism. Some of the biggest internet companies, including Apple, Google, Yahoo, Skype are involved. Although these companies deny knowledge of PRISM project. Lots of data bound for those companies passes over “content delivery networks” (CDNs), internet. NSA could be monitoring those CDNs. CISCO provide routers, network hardware to those companies. These hardware may have backdoors access to NSA. The companies themselves let the NSA spy over the personal information. Why in News/ Why problem? Obvious issue of invading privacy of individuals. These US Companies might be prosecuted in EU courts for handling over private database of EU citizens to NSA. Curious part = NSA claims their budget for PRISM project is only $20 million dollars. So experts wonder, how can NSA run such large complicated spying operation with such a small budget? Currently, India’s e-commerce market=~$1 billion and is expected to reach >$75 billion by 2020. Amazon=an American e-commerce company similar to our flipkart. India’s FDI regulations do not allow online multibrand retailers to sell their own products. Therefore, Amazon has entered in India through a marketplace model. Under this model, Amazon will not stock and sell its own products but help third-party sellers to exhibit their products on its web platform (amazon.in). Military grade cyber-weapons such as Stuxnet and flame, pose grave danger to nations, companies and individuals around the world. Stuxnet Computer virus developed by Americans, to disrupt Natanz nuclear site in Iran. But other organizations across the world, including in India, operating with the Siemens system suffered from collateral damage from the attack. A virus written solely for data gathering, or espionage. It can gather data from harddisk, computer microphones and web cameras even nearby Bluetooth devices and report data back to its command and control network located around the world. Iran has claims this virus wiped the hard drives of its oil refineries. Kaspersky (famous antivirus company) says flame is twenty times more complicated than Stuxnet. Flame’s creator is also unknown. But since flame’s function is not confined to stealing credit-card/bank passwords only- It means flame was created by some government agency (rather than individual hacker). Since 2003, the People’s Liberation Army has trained more than 30,000 cyber warriors and another 150,000 in the private sector. According to several reports, Chinese goal is to build the world’s best ‘informationised armed forces’. Since 2000-01, Pakistani cyber criminals defacing Indian websites and writing derogatory messages against India. Recently even Chinese hacked into computers of Indian government organizations. To protect cyberspace from cyber-threats. To protect private data of citizens and minimize damage from cyber-attacks. With help of government organizations + pvt.players. NTRO is a technical intelligence agency set up after the Kargil conflict. Already exists under Department of Electronics and IT. will protect Nation’s critical IT infrastructure in energy (natural gas, coal, oil and power), finance and banking, transportation (civil aviation and railways), space, law enforcement, security, telecom, defense, etc. will work on 24/7 basis. will design/acquire new processes for IT protection. ICERT will function as an umbrella organization. Under this, sectoral will be created to work on 24/7 basis. Provide tax reliefs/Fiscal benefits to businessman if they adopt cyber-security practices. Encourage all public/private organizations, to have a Chief Information Security Officer (CISO), responsible for cyber security. Encourage and mandate them to use certified IT products. Classify IT infrastructure based on risk perception so that adequate security protection measures can be under taken. Legislative reforms to help law-enforcement agencies in investigation and prosecution of cybercrime. International cooperation / collaboration with agencies of other countries. Ensure that all organizations keep a specific budget cyber security and emergency. Cyber crisis management plan for all e-Governance initiatives in the country, to reduce the risk of disruption. To engage Private IT experts/org. to assist e-Governance initiatives. In next five year, get 5 lakh workers in cybersecurity field. Public-private consortium to enhance the availability IT products based on open standards. PPP for setting up training institution for IT security. Bilateral and multi-lateral coop. with other countries for cyber security. Increase desi-videsi coop. among security agencies, CERTs, Defence agencies and the judiciary. To create a think tank for cyber security policy inputs, discussion and deliberations. Hold workshops / seminars, create awareness about IT security among web users. Regular cyber security drills & exercises at various levels. The sacred-unwritten rule of government policies=> they must mention “sustainable development”. I’m surprised that clichéd word is not used anywhere in this police. Secondly, policy doesn’t contain any fancy term/catchy name/scheme named after you know who. It means the bureaucrat who wrote this policy, is indeed an intelligent person who didn’t wish to harass UPSC aspirants. This cyber security policy specifically mentions: safeguard “citizen’s” private data. Does it mean foreigner’s personal data will not be safeguarded!? Recall that in UIDAI/Adhar, BJP’s criticism is: official policy every “resident” will get UIDAI number – meaning even Illegal Bangladeshis who’re ‘residents’ of India but not citizens, will benefit. Not much relevant from UPSC point of view, but might help in IBPS and other PSU exams where computer related current affairs is asked. Google acquired this company for nearly 1 billion dollar. Waze is a social navigation site. Now when a Waze user report accidents, traffic jams, construction delays and more on Waze, the updates will also appear on the Google Maps app. The inventor of the computer mouse. Also helped develop ARPANet, the government research network that led to the Internet. Windows 8.1 Preview apps include Facebook, Flipboard and NFL among other apps. Using a compressor that is routinely used in domestic refrigerators and air-conditioners. The system was operated non-stop at about -200 degree C for three months. Cooling of electronics — including telescopes and infrared sensors. Many scientific establishments and small industries that use liquid nitrogen to improve tool life. Electrophoretic Display= One type of thin display, consumes very low power. Example, Amazon’s e-book reader “Kindle”. They use tiny particles of titanium dioxide and a special blank ink called “E-ink”. Titanium Dioxide + E-Ink=> sandwiched between two parallel conductive plates. These particles move according to the electric charge and thus you can see the display on the screen. E-ink is similar to print ink and does not emit light. Specially designed to consume minimum power, so you can use it for outdoor camping, where recharging facilities are not available. + built-in GPS chipsets, weather sensors and radio communication technology. 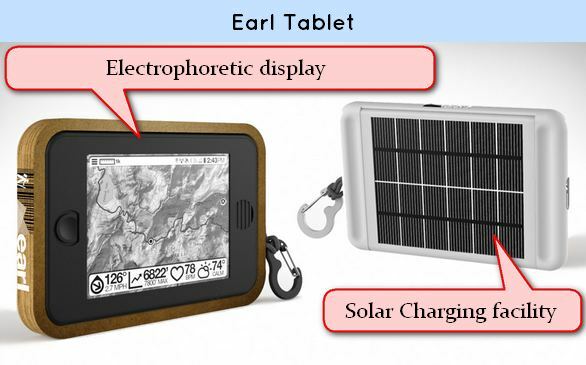 Earl can provide 20 hours of battery life and recharge itself in 5 hours of direct sunlight. Medical: specialized items for rare transplants can be created rather than wasting precious time. E.g. American doctors created a windpipe splint for a six week old baby boy whose airways were collapsing. Space: NASA has created an injector plate for its rocket, using 3D printer. This inject plate helps deliver fuel and oxygen to the rocket propulsion system. 3D printed parts: low cost (for such sophisticated purpose). Wi-Vi= use of wifi to see through the wall. Concept similar to radar and sonar imaging. It transmits a low-power wi-fi signal and uses its reflections to track moving humans. Even if a person is in closed rooms or hiding behind a wall, he’ll be detected. Nano silicon=> can be used as Anode in high-performance batteries for future electric vehicles and portable devices. They’re superior to graphic anodes. They’re more resilient to Heat, easy to store and dispose. Have higher charging capacity than lead batteries + longer operational life. Problem=Nano-Silicon very expensive at the moment. Researchers working on method to produce Nano-silicon particles from rice husk. In rice husk, silica existed naturally in the form of nanoparticles and accounted for as much as 20 per cent of its dry weight. American researchers have “painted” the Mona Lisa on a substrate surface approximately 30 micrometers in width—or one-third the width of a human hair. 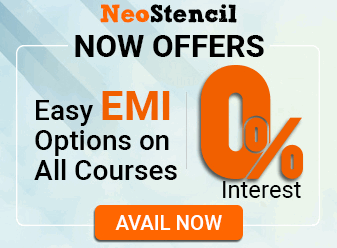 This Nano-painting technique will be useful in Nano manufacturing of devices+ nanoelectronics, optoelectronics and bioengineering. Ampacity = the maximum amount of current a conductor can carry before losing its electrical properties. Lately researchers focused more on boosting conductivity than ampacity. But Japanese researchers embedded carbon nanotubes in copper, the resulting new material’s ampacity gets boosted to a massive 10,000 per cent than copper’s. It reduces the amount of copper required to assemble a conductor. + 100 times higher performance. As electrons move inside the conductor, they are often scattered by atoms in their path. As the current density increases, scattering also increases until, at a threshold called the conductor’s rating, the material can no longer conduct the electrons, resulting in electro migration. CNT-Cu achieves higher ampacity by suppressing electro migration. In metatronics, nano rods and the spaces between mimic the behaviour of resistors, capacitors and inductors. How does American Global Positioning System (GPS) work? They’ve a constellation of 24 orbiting satellites, supported by a global network of ground stations. Thus GPS covers every part of the world. 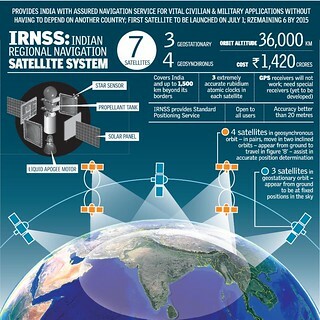 Indian Regional Navigation Satellite System (IRNSS) to run Indian global positioning system. Government approved project in 2006, with budget of ~Rs.1500 crores. Given this small budget, it is beyond the aukaat of ISRO to maintain 24 satellites, cover entire globe, Hence our Desi GPS will use just seven satellites, and try to cover India + 1,500 km beyond its borders. hub of the whole system is the ISRO Navigation Centre at Byalalu, near Bangalore. These three of the satellites will be placed over the equator, in the geostationary orbit. they match the Earth’s rotation and therefore appear from the ground to remain at a fixed position in the sky. will be in pairs in two inclined geosynchronous orbits. From the ground, these satellites will appear to travel in figures of ‘8’ during the course of a day. All seven IRNSS satellites will be at a height of about 36,000 km, taking a whole day to circle the Earth. WHERE? Satish Dawan Space Centre in Sriharikota. IRNSS satellites transmit signals in two microwave frequency bands known as L5 and S.
Since these microwave signals travel at the speed of light, the delay between a signal’s transmission and its reception allows a receiving device to compute its distance from the satellite involved. With data from those satellites, the receiver (the GPS-like gadget) can then work out its own position. Navigation satellites periodically transmit their precise position in orbit along with the exact time when each transmission takes place. Navigation satellites therefore need to carry extremely accurate clocks. Each IRNSS satellite is equipped with rubidium atomic clocks, to keep precise time. Restricted Service: Will be available only to the military and other government-authorized users. The standard GPS receiver (in your smartphones and tablets) will not work with IRNSS. You’ll need a special receiver equipment to use navigation data from IRNSS. was in news because ISRO planned to launch it in Aug’13 but #epicfail thanks to fuel leak. Official name= Cherenkov Telescope Array (CTA). Has 27 countries including India. No telescope based at one point on Earth can see the whole sky. Therefore, CTA project aims to set up two observatories. One proposed northern hemisphere location is in Hanle, Ladakh, Jammu and Kashmir. a large number of photometric and spectroscopic nights at par with other similar places in the world, like La Palma in Canary Islands and Arizona desert, U.S. Advantages of Gama Ray Telescope? While existing telescopes, like MAGIC (Canary Islands) and VERITAS (Arizona) are efficient up to the 100-GeV energy mark, the CTA will be able to reach up to 100,000 GeV with the same efficiency. Gamma rays originate from sources like dark matter annihilation, dying stars and supermassive black holes and then travel through space. Therefore, by studying Gama Rays, we can study those bodies. When gamma-rays hit atoms in Earth’s upper atmosphere, these Gamma Ray Telescopes will observe and track them back better to their original sources. these particles are in constant motion, and they influence the alignment of the Sun’s magnetic field. Thus, every 22 years, the Magnetic field of Sun changes by 180 degree, this is called Magnetic flip. This period is called a solar cycle. NASA has been monitoring this, and predicted that next flip will happen in late-2013. It could influence cloudiness and the climate on Earth, even cause storms..
Chinese Space Mission for Moon. Change’E = Chinese Godess living on Moon. took higher-resolution images of the whole Moon. Chang’E-3 will land a rover to the Moon by the end of 2013. Imperial College London it is possible to land astronauts on Mars by 2021! Here is how.. The main challenge is how to construct a spaceship that is big enough to hold enough fuel for both to and fro journey. So, instead of sending one rocket, send two rockets. Will have robots + empty fuel tanks. Robots will dig up ice on Mars. Once the ice is melted, we can use solar electricity to produce hydrogen and oxygen to fill the fuel tanks. Will send three men and reach Mars in 9 Months. They’ll use above fuel tanks for their return journey. Brazilian Astronomers found a twin-star of Sun, known as HIP 102152. The constellation of Capricornus (The Sea Goat) nearly four billion years older than Sun. Benefit of studying Sun’s Twin? will help increase our understanding of Sun. will allows scientists to predict what may happen to our own Sun when it reaches that age. During Big Bang, Lithium was created along with hydrogen and helium. Astronomers observed that when star gets old, its lithium content decreases. Sun’s lithium content appears to be normal for its age at the moment. Earlier, NASA’s Voyager2 and Galileo spacecrafts took some photos. They found ice-covered world + signs of a liquid water ocean under Europa’s surface. Hence NASA Believes Europa could hold life forms. Astronomers found an ocean anywhere from 5 to 30 miles deep, trapped beneath a frozen surface of Dione. And if water is found in any planet/moon=chance that there will be Alien lifeform. Nasa’s Opportunity rover=> on Mars. During Mars-winter, it will just camp at a slope called Solander Point=> to survive in harsh winter and get Sunlight for power. Opportunity rover has survived five Martian winters since it landed on Mars in 2004. Mount Sharp= in the middle of Gale Crater on Mars. From this area, Scientists hope to find evidence about how the ancient Martian environment changed and evolved. Hence in July 2013, NASA’s curiosity rover was directed to move in this area, to collect samples. Humans have long known to display a tendency for identifying shapes or hearing sounds from random sources and attaching significance to them. e.g. in clouds you’ll see shapes of bear, car etc. Scientists call this psychological phenomenon of deciphering shapes from random patterns = Pareidolia. In Sept 2012, the Curiosity rover took photos from Mars, before collecting sand samples. When these photos posted on internet, several bloggers claimed they saw a rat in the picture. NASA plans to parachute a robot into a sea on Titan. Because Lake Lander has a few characteristics an alien sea. It’s surrounded by a barren environment with a thin atmosphere and is vulnerable to storms, avalanches, and possibly volcanoes. The first scientists thought it was a meteorite but no traces of meteorite were found on the crash site. So, they deducted, it must be Comet. Because Comets are essentially muddy ice balls, they could cause such a devastation and then ice would have evaporated=hence no evidence. But now, scientists have found evidence that the Tunguska devastation was indeed caused by a meteorite and not by a comet. Together ILC + LHC =will help better understanding of Higgs Boson, Dark matter and unlock the secrets of the universe. INS Arihant is the first Indian nuclear-powered submarine. Its enriched uranium is supplied by Rare Materials Plant (RMP) of the Department of Atomic Energy (DAE) at Ratnahalli, Karnataka. New super-heavy element has 115 Atomic Number. It is yet to be named officially but temporary name is “Ununpentium”. Was discovered by a Russian scientist way back in 2004. At present, International committee of scientists looking into its research data, may be included in the official periodic table. Gold is rare on Earth in part because it’s also rare in the universe. Now scientists believe, gold would been created because of short gamma ray bursts in the galaxy. Two dead neutron stars collided. Short gamma-ray burst (GRB) produced. After this blast, a unique glow that persisted for days at that location. Scientists believe this glow signifies presence of heavy elements—including gold. Q. Fire does not exist in the absence of air but how is it possible for the sun to have immense heat and chemical reactions in the absence of air? Fire is a chemical reaction that needs a fuel and oxygen present in air to exist. Sun mainly consists of two gaseous elements: hydrogen and helium. In the nuclear reaction occurring in the sun, called a fusion reaction, four hydrogen nuclei combine to form one helium nucleus and also release a large amount of energy. Fire needs fuel, oxygen and a little initial heat to start a reaction; remove any of them and fire ceases to exist. The sun doesn’t need any oxygen and can continue to produce heat by the continuous conversion of hydrogen to helium. An Electrophoratic screen consumes more electricity than an LCD screen. Titanium dioxide is used in Electroporetic screens. The maximum amount of voltage, a galvanometer can carry before losing its electrical properties. The maximum amount of current, a conductor can carry before losing its electrical properties. Implementation of IPv6 protocol across the world. Protection of web users’ personal privacy against government backed invasion such as Project PRISM. Protection of freedom of speech on the internet. Gamma rays cannot travel beyond Earth’s upper atmosphere. A comet is a small, icy celestial body that orbits around the sun. Define Nano-Technology. Discuss its applications in Medicine and electronics. Define digital divide and list the measures taken by government to bring down digital divide in India. National Cyber Security Policy-2013 will improve India’s preparedness for countering cyber threats. Comment. Examine the need for an international policy on cyber security. Write a note on ISRO’s IRNSS project. Indian Government should also fund a project to build our own version of flame/stuxnet virus. Agree/Disagree. Why? India shouldn’t waste money on building IRNSS, there is already a fully functional GPS system. Tax payers’ money is better served in food security and poverty removal. Agree/Disagree. Why? Mrunal Sirji, waiting for hindu Science tech compilation of Sept and Oct..
@mrunal:following link doesn’t exist..please make corrections. u r work is incomparable.